TONIGHT'S GATHERING IS CANCELLED DUE TO WEATHER. If you've lost a spouse, child, family member or friend, you've probably found that there are not many people who understand the deep hurt you feel. GriefShare is a support group for people who are grieving the loss of a loved one. This group is sponsored by people who understand what you are experiencing and want to offer you comfort and encouragement during this difficult time. Each session includes a video seminar and group discussion. A GriefShare workbook assists you with note-taking, journaling and grief study. This program is designed to help you heal and to move from mourning to joy. You are welcome to begin attending the GriefShare group at any session. 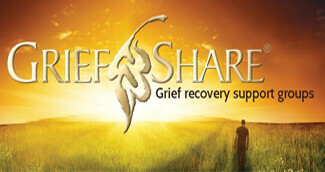 GriefShare is a non-denominational group and features biblical teaching on grief and recovery topics. Please join us for the next GriefShare session. We know it hurts, and we want to help!